Going to trial can be like walking on the brink of a waterfall. I thought of this today as I was climbing boulders in Yosemite National Park to get to the base of a waterfall. 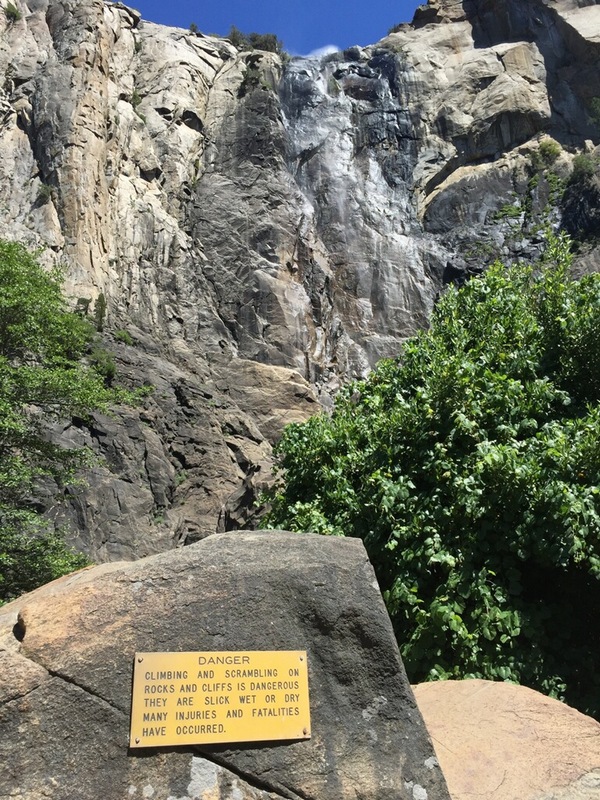 It began with a short hike to the viewpoint for Bridal Veil Falls. At that point many people scramble up the boulder strewn creek bed below the falls trying to reach the base of the falls. Most who begin the climb turn back without finishing. This is because they slip and slide on the water polished surface of the boulders. For hundreds of years the creek’s eroding flow has polished the boulders’ surface so they have little traction for even rubber bottomed shoes to grip. Imagine trying to ascend an ice-covered slope and you get an idea of the intimidation factor in scrambling over these boulders. I accomplished the climb by choosing a route that offered the greatest traction and because I had spent some of my youth in the Alps rock climbing. Tragedy taught me to be wary of waterfalls. When I was eleven years old, and not old enough to be a boy scout, the scoutmaster in my boy scout troop died while on a boy scout hike because he did not appreciate the danger that waterfalls pose. The outing was a typical weekend “overnighter.” The scout troop departed the scoutmaster’s home Friday in the late afternoon and planned to return Saturday afternoon. The scout master was the only adult, and five scouts crowded into his car with their backpacks. They drove to the mountains above our town, parked the car, and began the planned three mile hike. The route took the group across a small stream in Farmington Canyon at a point where the stream went over a waterfall of no great consequence. As the scouts were crossing the stream near the brink of the waterfall, the young scoutmaster stood on the verge of the falls to insure that none of the scouts ventured too close to the edge. Unfortunately, the scoutmaster apparently did not understand that the stones at the verge of the falls are polished to a near glass-like smoothness by the water rushing over the falls, and he slipped from his position and fell over the falls, landing in knee-deep water. The group of scouts rushed to help their scoutmaster. He was still conscious and told them, “Don’t move me. I’ve broken my back.” The scouts followed orders so he lay in very cold, snow melt water at the base of the falls. The scoutmaster gave his car keys to the oldest scout, Larry who was barely 15, and asked him to hike back to the car and drive down the mountain road in the dark to summon help. While Larry was gone, the other scouts, all who were 12 and 13 years old, collected wood and started a fire on the edge of the frigid pool in an attempt to warm their shivering scoutmaster as he lay in submerged in the pool and the cold night air. Larry made it down the mountain, and stopped at the first home he came to. He awakened the family and asked them to call the Davis County search and rescue team. The rescue team was dispatched to the base of the waterfall. The next morning, the Salt Lake City Tribune carried a front page picture of the rescuers carrying the scoutmaster strapped into a rescue litter. I wish the end of the story was a happy one — it is not. The young scoutmaster, a father of two, died before the morning edition of the Tribune hit subscribers’ front porches. I remember my pain and the fear that gripped me as I saw the picture and realized that in several short months I would join that troop. I remember attending church the following morning. The church sponsored the troop. A heavy sadness for the scoutmaster’s wife and children was palpable. I remember the faces of boys only a few years older than me as they sat silent with watery eyes not knowing what to say, or how to respond to people expressing concern for them. I remember it after 50 years as if it were yesterday. The troop did not fold. It continued, and became stronger and better. The young men who were on the hike that night were changed and grew into strong leaders in part due to that experience. The Boy Scouts, from that and similar experiences, implemented changes such requiring that two adult leaders must attend every activity. There was a lot of learning and growth that followed the tragedy of that troop. Trial is the same. I always learn more about myself and my approach to trial from the trials I lose, than the trials I win. My latest trial is no exception. I have learned in the quiet moments of the night when sleep evades me and lay pondering what went wrong. To be a truly self-actualized, anyone who wishes to be a trial lawyer must be willing to stare at the pain of loss, and ask, “Why?” Why did the jury not like my client? How could I have told a more compelling story for my client? Did I do anything that got in the way of my client connecting with the jury? Where did I go wrong? If we realistically assess our approach to trial and examine our personal weaknesses in front of the jury we can grow and learn from experiencing loss. I never want to get to the point that I am winning every trial (did I really say that?) because it will mean that I playing it safe and swimming in the shallow waters rather than taking the risk on the verge of the waterfall to protect those who I care for. I think often of the scout master I never met who sacrificed so much to assure the safety of his scouts crossing that stream. I hope I use his example as a guide in taking on the powerful and wealthy to protect those least able to protect themselves. That is the truly great lesson for me in the tragedy of the waterfall.